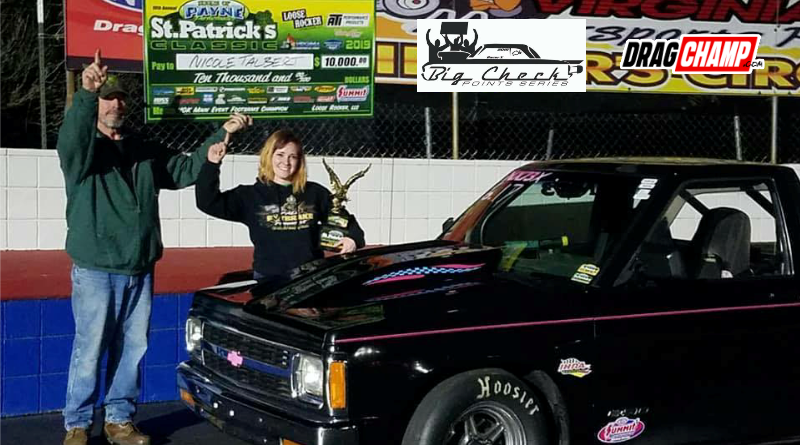 Nicole Talbert of Inwood, West Virginia was voted the March Big Check Bracket Racing favorite racer of the month. Nicole finished tied with Chris Gulitti in the voting. Nicole’s most recent Big Check win came at the Loose Rocker St. Patrick’s Classic where she captured the $10,000 Footbrake win. Paige Hamlin at Big Check Bracket Racing caught up with Nicole to learn more about her racing operation. NT: I mainly race in the Footbrake class, but have competed in the Top ET/Super Pro/Electronics class as well. I am definitely more competitive in the Footbrake class. This year, I am planning to race mostly at Maryland International Raceway and Capitol Raceway. NT: My race car (truck) is a 1991 Chevy S10 with a 421 SBC and a powerglide transmission. It’s black with a pink pin-stripe and has looked the same ever since I started racing it about 10 years ago! It started out running 8.70s or so in the eighth and now runs 6.20s. It may look the same, but it’s definitely undergone a lot of changes mechanically! What’s on your bucket list, future goals? NT: I’d like to win a track championship in a “big” car and the Summit Super Series. I’d also like to catch up to my dad in the number of big checks he has. Check out Chris Gulitti’s Racer Spotlight Article here. NT: My truck, of course. After that, I love 1969/1968 Chevelle’s, preferably with black vinyl tops – they are just gorgeous cars! NT: I am a Commercial Insurance Account Manager. NT: My dad because that means we both can’t win! NT: There’s plenty – one time I drove eighth mile stripe in a quarter mile race, another time I didn’t have the truck in low gear when using the delay box, and my seat has gone all the way back when I left the line and my foot came off the gas pedal. NT: Be green! Or better yet, I try NOT to think because that just causes problems. NT: Everything – the competition, the people, the cars. Are you superstitious? If so, what are they? NT: I guess I would say “love to win.” Winning a race is an amazing feeling, but even if I don’t win, I am just happy I am racing and learning how I can improve. NT: I would say I’m pretty decent at both… sometimes. NT: The feeling of winning – there’s nothing else like it. NT: 2018 Jeep Grand Cherokee I don’t really have a favorite – I listen to everything from rap to classic rock! NT: 2018 Jeep Grand Cherokee There are sports other than drag racing? I don’t really watch any sports at all. NT: 2018 Jeep Grand Cherokee I like to work out and shop when I’m not racing. NT: I’m not really sure how to answer that one! NT: I don’t know – I’m pretty boring. I graduated high school a year early, at age 16. NT: I am definitely a homebody! What’s your favorite thing to eat? Individual item, meal, or restaurant? NT: I LOVE pizza, but my favorite restaurant would probably be California Tortilla. NT: My dad definitely helps me the most – he is the best mechanic, teacher, friend, and father around. I could never thank him enough.